Although the Rebel Alliance has won a few battles against the Empire, hope is fading. The Empire is about to finish building the greatest weapon the galaxy has ever seen-the Death Star. The rebels' only chance to defeat it now lies in the unlikely hands of a princess, a scoundrel, and a farm boy. . . .
Acclaimed, New York Times bestselling author Alexandra Bracken delivers a captivating retelling of Star Wars: A New Hope like you've never experienced before. Since the premier of the original film, Princess Leia, Han Solo, and Luke Skywalker have become iconic, larger-than-life characters. The Princess, the Scoundrel, and the Farm Boy takes a deeper look at these three heroes as they join forces to defeat the evil that threatens their entire galaxy. Alexandra Bracken is the New York Times bestselling author of The Darkest Minds and Never Fade. Born and raised in Arizona, she moved east to study history and English at the College of William & Mary in Virginia. Alex now lives in New York City, where you can find her hard at work on her next novel in a charming little apartment that's perpetually overflowing with books. 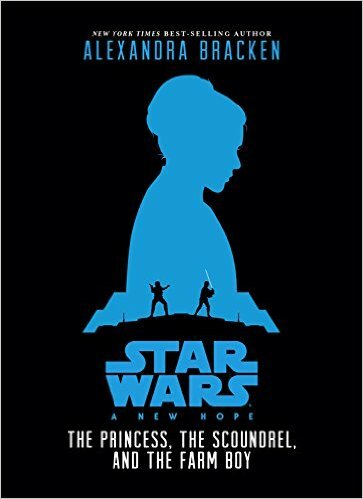 Star Wars: A New Hope The Princess, the Scoundrel, and the Farm Boy by Alexandra Bracken in a wonderful book! I love Star Wars and up until now have only ever watched the movies but reading this book is a real treat. I love that the Princesses part is told from her point of view. It goes much deeper into the characters and there's so much more story line in this book than in the movie. This book is beautifully written and is sure to be loved by any star wars fan! by Alexandra Bracken on Amazon, Barnes and Noble and other bookstores.